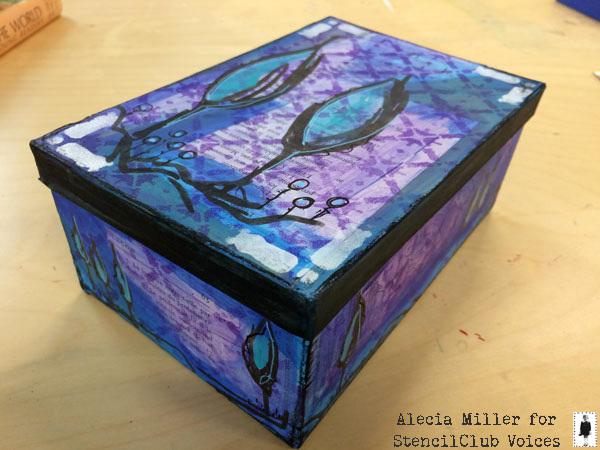 Josefine Fourage, Alecia Miller, Dianne Hicks and I had a ball making cards, collages, boxes, and art journal spreads with this month's club stencils. I'll let them take over this post in their own words with art that is sure to inspire! I know Kristie Taylor from a design team we both have been on and I have always adored her art. 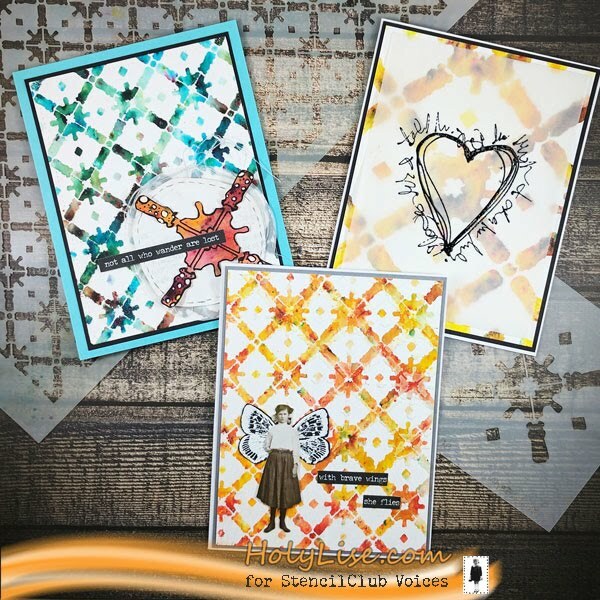 That’s why I’m so thrilled to be able to play with her stencil designs for February and showcase them for the StencilClub Voices. I created another background without the stenciled areas and decided to use this as my focal point. Well, part of it. The 4x4 stencil looked a little bit like a ship’s wheel to me, so I outlined the shape using a black Posca pen and then fuzzy cut it. This ended up being the focal point for one of the cards – including some gessoed school book paper and a piece of vellum. 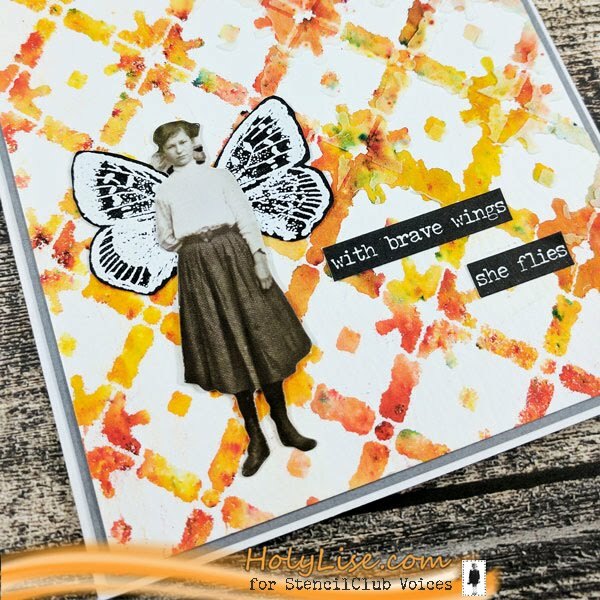 For the second card, I added a layer of white texture paste through the 9x12 stencil on top and after that was dry, added a paper doll with wings as the focal point. Card number three is using the background from the 6x6 stencil. 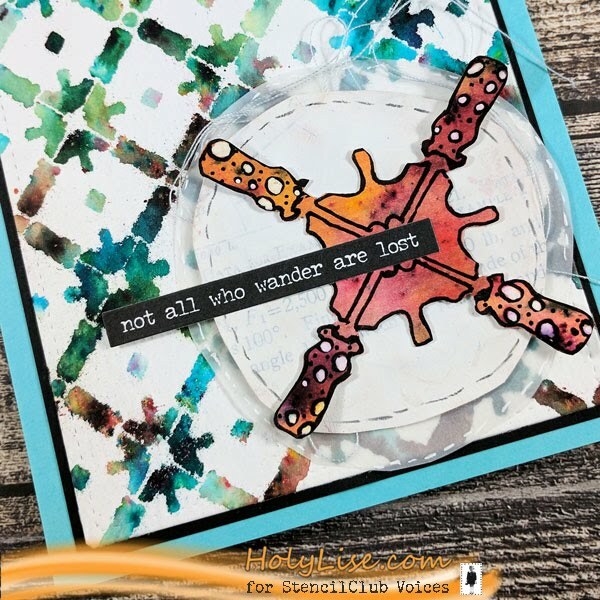 For the focal point, I cut a piece of vellum and stamped and heat embossed a squiggly heart on top and then adhered it onto the background. In my artwork I typically use stencils to build up background layers and the February stencils are perfect for that! I love having repetitive patterns carry through my work in different sizes. The first thing I did with these stencils is to just play and create some background layers for my stash to be used as the mood strikes. I used one of the smaller backgrounds to create my February Mandala. 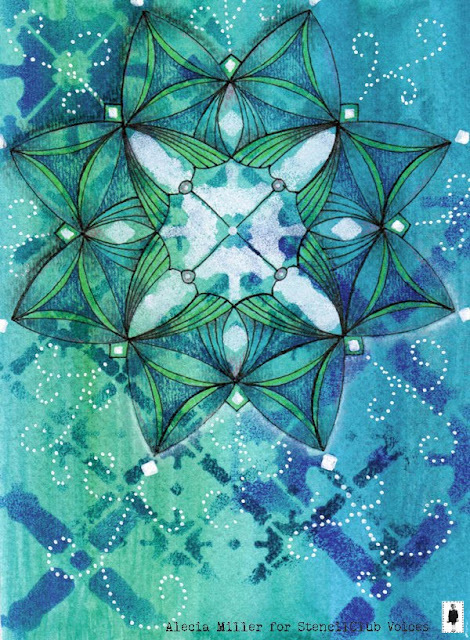 I layered the stencils in various shades of blue and then used the 4x4 in white as the center of my mandala. I'm not sure if the result is more wintery or watery. The details in the pattern made it easy to pick out elements to repeat and build off of in my drawing. I also used the smallest version (although the biggest stencil!) as a background on a memory box. While the pattern may have been inspired by interiors, it reminds me of a garden trellis and felt like the perfect back drop to the loose brush stroke trees. I see these stencils getting a lot of use in my studio going forward! I had great fun with the February patterns and creating my papers, artwork and journal pages. 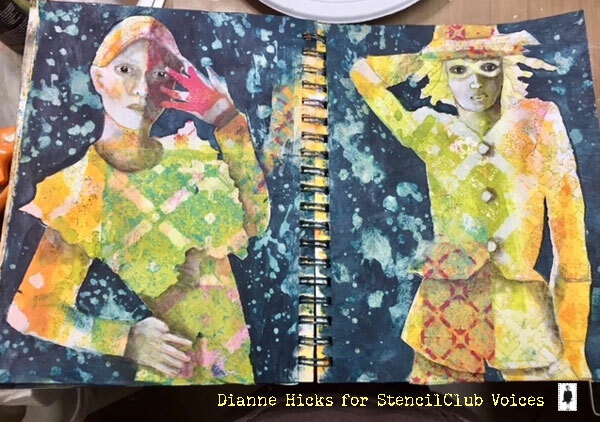 I first worked all day to create collage papers with the stencils both on a Gelli Plate and also by applying the paint with sponges and rollers directly to deli paper. I made a nice little stash to use before I decided what my subject was going to be. I knew I wanted to work with a still life and the papers kind of predicted where to go from there. I started out thinking teapot but, as it often goes, there was this one little piece of printed paper that I fell in love with and decided it needed to be kept -- so it became the vase. 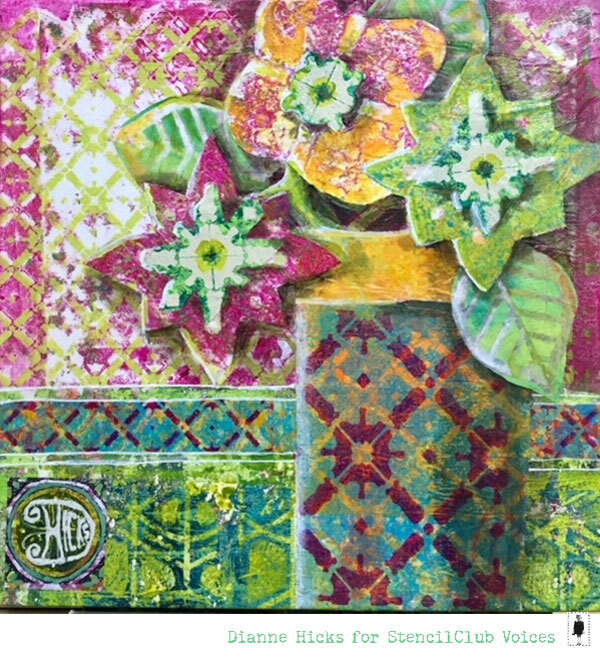 The flowers and floral centers were created from the smaller and medium stencils and the back ground and mid-line border were created with the lager stencil. 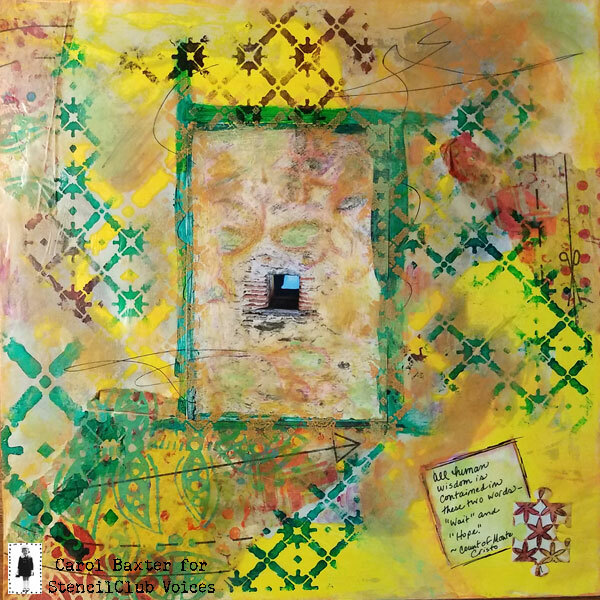 I used Golden Gel Medium to adhere everything down to a 12x12 gessoed canvas. I called this one “Vase with Voices”. 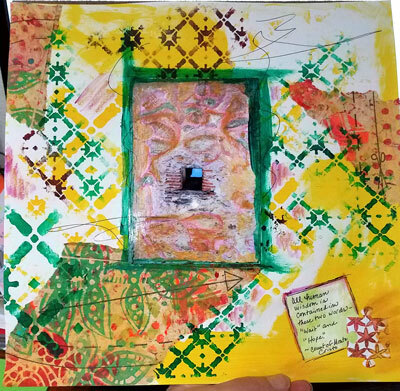 This mixed media project evolved over a few weeks and sent me out of my comfort zone and into faux encaustics -- I am pleased with it. I call it Hopeful Window. All human wisdom is contained in two words -- "wait" and "hope". Using a technique gleaned from Jen Cushman, I poured/painted a thin layer of beeswax over everything but the window and then stenciled in orange and hits of green, and salsocratched a bit more on the beeswax. I like how the beeswax knocked the color back. We hope Kristie Taylor's Grandmother's Kitchen set has sparked your imagination as much as it did ours. You can listen to her inspiration for this set in an earlier post. 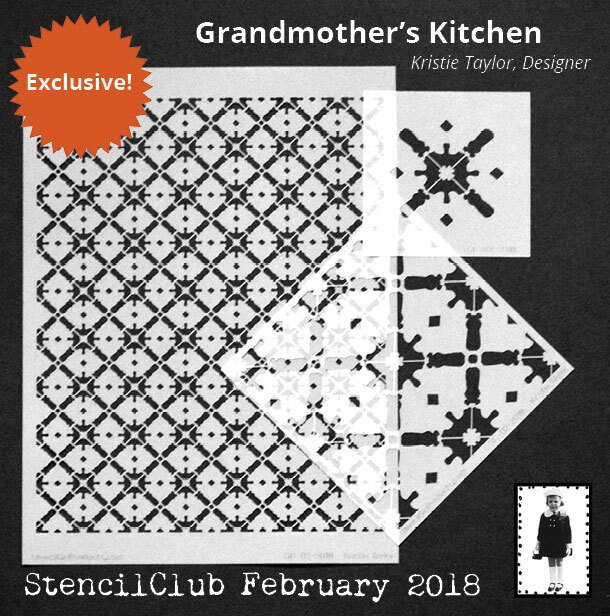 If you need these stencils, be sure to join StencilClub.